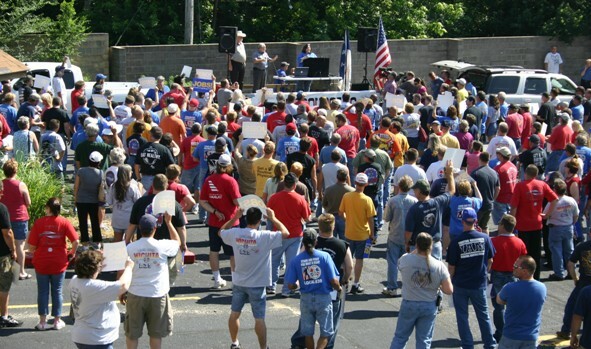 IAM members in Wichita, KS, held a rally to support their negotiators and to oppose additional outsourcing of work to Mexico. Gathered in the heat outside the hotel where negotiations are taking place between District 70 and Spirit AeroSystems, workers and their families carried ‘Jobs Worth Fighting For’ signs and cheered as union leaders praised Spirit as the only aerospace company in Wichita, KS, that has refused to outsource work to Mexico. Bombardier and Cessna have both outsourced work from Wichita to Mexico, while Hawker Beechcraft has closed its Salina plant and recently notified the union it intends to outsource more work. IAM members at Spirit will get a look at the company’s proposal on June 21, with a ratification vote scheduled to take place on June 25. Click http://www.d70iam.org/ for the latest information about the negotiations.